Caladium lindenii ‘Magnificum’ with its striking feature of almost deep bluish green against its silvery white venation is definitely a wonderful addition to our garden! Besides, it is quite hardy and so easy to grow and propagate, needing very little attention! Botanical Name: Caladium lindenii ‘Magnificum’ (formerly a Xanthosoma and still widely known as Xanthosoma lindenii even though it was transferred to the genus Caladium by Michael Madison (1981). Plant type: An ornamental perennial shrub, native to Columbia. Light: Semi-shade to full shade. Can tolerate indirect sunlight but shelter from full sun. Moisture: Regular watering as it requires lots of water and maintain humidity. Soil: Moist fertile soil but well drained. Any potting mixture though loamy or sandy loam soil is ideal. Propagation: By dividing its tuberous rhizomes. Features: An evergreen herbaceous shrub, grown for its beautiful variegated foliage. Plant can grow into a dense clump to about 2-3 feet tall and as wide. It has large and showy thin-leathery leaves that are arrowhead-shaped (sagittate), somewhat elongated and slightly rounded with prominent ears, resembling angel’s wings! Leaves about 1-1.5 feet long in dark velvety green and broadly veined in striking silvery white are held on slender greenish brown stalks that are rough or tomentose. Stalks can be upright or arching measuring 1-2 feet long. Care: For optimal growth, place it at filtered sun position, provide humidity and regular watering during growing season. 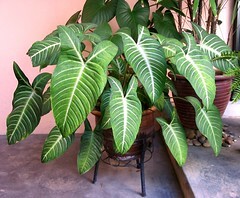 Fertilize once monthly with a well balanced foliage fertilizer. Look out for mealy bugs or white flies on the undersides of its leaves and pythium rot. Take note that handling plant may cause skin irritation or allergic reaction in some people, so be careful. 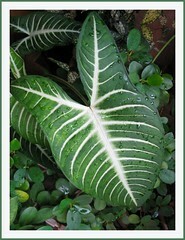 Usage: Since Caladium lindenii has low light requirement, it would be excellent as a potted houseplant or additional indoor foliage plant for patio, pool deck or even in greenhouses or conservatories. It can be used as an ornamental outdoor plant to splash color amongst other green foliage plants in shade gardens or woodland gardens. For sub-tropical & temperate regions: As characteristic of caladium, it produces tubers and undergoes a dormant period during which it loses its leaves but will come back when weather warms. Further info, check at TopTropicals.